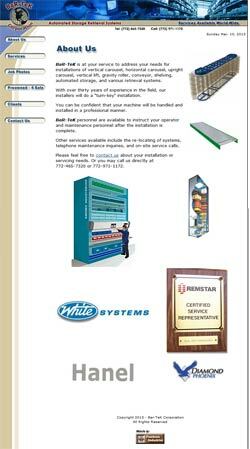 The following is a representative selection of websites I have developed and host at Foxstone Industries. These sites run in a Unix/Linux environment and are developed with PHP. Most sites shown here use MySQL for back end database support. Please feel free to visit any of these sites. CBM of America is a medium to large corporation with facilities in Florida, Georgia, and New Jersey. They support networking and network design hardware for the Telecomunications Industry both nationally and internationally. It makes very heavy use of MySQL database for customer/employee logins, product database, and internal intranet sales tools for the Sales Staff. We also support a geographically separate mirror of their site (www.cbmusa.org) for backup and disaster purposes to insure 24x7 availability. Learn more about Business Continuity services here. iTi Tropicals is a nationally known Tropical Fruit Product importer/distributor. Their fruit products are included in thousands of products on your local supermarket shelves and freezers. 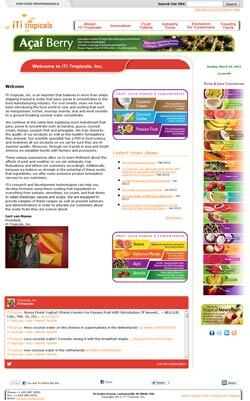 This site is the lead site for a family of 15 traditional and 2 mobile (at last count) Foxstone developed websites dedicated to specific fruit products. Like the previous site, it uses a custom graphic presentation. If you visit with iTiTropicals, be sure to use the QuickMenu navigate feature to visit with their other sites. This site (as well as their www.iTiSamples.com site) use SSL to interface with their Credit Card Merchant Account. 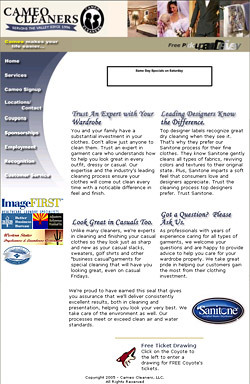 This custom layout for Cameo Cleaners also has numerous Flash graphics. Each page uses a unique Flash Introduction for the Title. Corporate taglines and specials are also displayed in eye catching graphics with Flash. The customer has a back end that allows them to change the job openings and free ticket giveaways. Using SSL, this site has several signup forms for both Job Applications, requests for joining E-Mail list, establishing a Charge Account, and applying for Pick-up/Deliver services. In The Stars, a SALES Site, is a unique site that gives historical and reference information about Horoscopes as well as offering custom horoscopes for purchase. This custom site actually began its inception with Foxstone Template #312 as the seed of its layout. 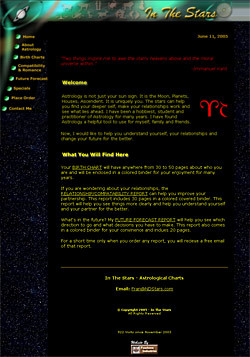 The number and type of changes made were quite extensive; many astrological signs and planets were added into the header and the entires site floats on a starfield. This site is an example of how the templates can assist with a startup look and feel for your site, and have it evolve into something quite more mature. This site is based on Foxstone Template #177. In addition to information, services, and contact forms; this site make heavy use of Foxstone's picture gallery application. 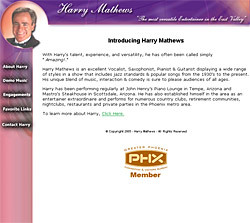 Harry Mathews, a popular entertainer here in the Valley of the Sun, chose Foxstone Template #63 as the basis for his site. Harry updates his own perfomance schedule on a routine basis. The site also has audio and video demo clips of himself. 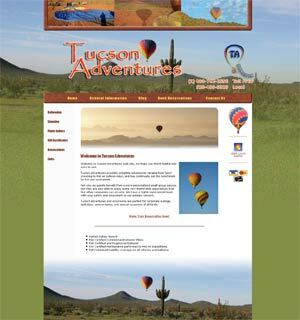 Tucson Adventures provides hot air ballooning, shooting, and outdoor excursions in the Tucson, AZ area. This sales site combines Flash, galleries, and e-commerce in a total package with an Arizona motif. This site was developed on a completely custom basis with the look, feel, and functionality evolving as the site development progressed. 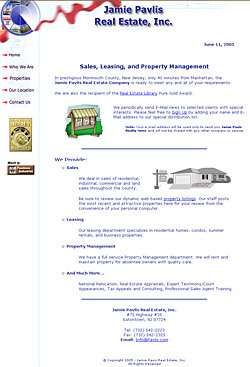 Jamie Pavlis Realty, a New Jersey based realtor, was built using Foxstone Template. Taking advantage of Foxstone's Realty Site configuration, the client posts and deletes properties in real time.